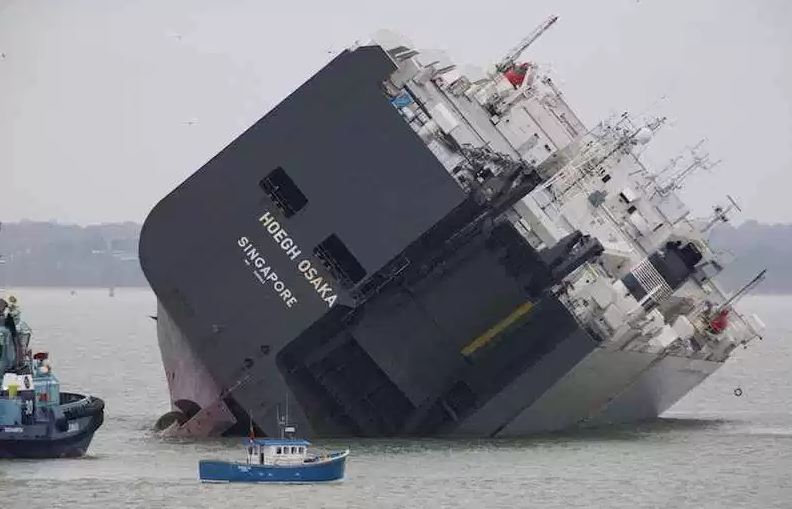 The Hoegh Osaka had no chance of surviving the Bramble Bank turn shortly after the vessel departed from the port of Southampton on January 3, 2015 with inadequate stability, according to the investigation into the ship’s listing, flooding and grounding on the Bramble Bank in The Solent. The UK Marine Accident Investigation Branch released its report on the investigation on Thursday, citing a failure to assess stability following cargo operations and prior to departure. A Spanish cargo ship breaks in two after washing up on the coast of the Basque region in the south of France. Deborah Lutterbeck reports. A military helicopter has evacuated the crew of a Spanish cargo ship that slammed into a jetty and split in two in choppy Atlantic Ocean waters off southwestern France. Two container vessels collided at Suez Canal. MV Colombo Express and the MV Maersk Tanjong collided at the mouth of the canal, knocking three containers from the Colombo Express. See the video at https://www.youtube.com/watch?v=2ktwo-k-onk (starting from 02:00 min). This seem to happen in Komi region of Russia according to the car plate. As we all know, the Internet has completely changed the way transshipment centers go about marketing their installations abroad. Until the nineties, they still relied mainly on advertising, e.g. in foreign trade magazines and specialized publications. Today, of course, the Web has changed all that, as many portal authorities rely to a large extent on sprawling websites to advertise their installations. Yet, in a new twist, one organization, the Canadian Port of Montreal, has decided to use a hybrid approach in order to achieve its goal of developing the German export market. SAN LEANDRO, CA & HONG KONG, 28 September 2012 – Hong Kong based arl-shipping.com Limited and smart-Tecs (USA) announce partnership and offer their customers a complementary set of products and services. The partnership between smart-Tecs and arl-shipping.com is aimed at seaport terminal operators, which require advanced hardware, software automation, security and tracking systems. Please register to post your own news. Use this form to post your press releases, news, and articles: company news. Note that articles having pure advertisement content are not accepted. Please note we have news moderation in place, it will take about 1 business day before your news article gets published. If you have a nice illustration for the article - don't hesitate to publish or attach it.